A quality sports bra is an essential piece of apparel for any female tennis player. Top-notch support allows you to move freely on the court and, more importantly, feel comfortable so you can perform your best. Sports bras are easily categorized into three main categories: high-impact support, medium support, and light support—all having their own physical benefits on and off the court. Our well-endowed friends might gravitate (pun intended) toward our selection of high-impact sports bras. Bolle Barely Bolle Tennis Sports Bra, the Nike Pro Rival Bra, the Fila Running With Roses Seamless Bra, and the Under Armours Space Dye Bra are just a few great options for a high intensity workout or match. All four include top of the line compression, some even feature molded cups to maintain shape. They have advanced technology that’s designed to wick away sweat and optimal moisture management to keep you cool during a long match. Take the court with confidence no matter your bust size with one of these super supportive options. Depending on your intensity level on the court, a medium-impact bra might adequately suit your needs. As the name suggests, they provide mid-range support, and the compression fit is ideal for all athletic activities. 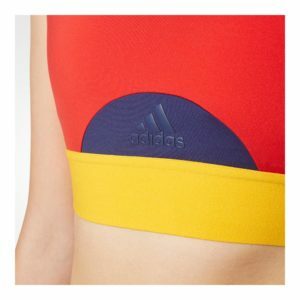 Some of the most popular medium support bras include the adidas New York Pharrell Williams Tennis Bra, the Nike Pro Classic Padded Sports Bra Bordeaux, the Fila Prism Seamless Bra, and the adidas Techfit Bra. All four include optimal support and range of motion, as well as advanced technology fabric for the ultimate in breathability. You’ll find these bras to be a comfortable option for a day at the courts. Low-impact sports bras place a premium on comfort, though they can still be ideal for recreational tennis, yoga, a brisk walk or even a lazy day at the house. Some of the top sports bras in this category include the EleVen Power Play Tennis Bra, designed by Venus Williams, the Bolle Seamless Multi-Way Adjustable Tennis Bra, the Bluefish Sport Tennis Bra and their Hipster Tennis Bra. All bras include support and light compression, as well as technology that is designed to keep you feeling dry at all times. To find the right bra for you, check out our website at TennisExpress.com. ← Stand Out in Nike’s New Fall Line for Women!